Intermediaries are architects and designers who specify, wholesalers who distribute, and retailers who sell community wood products. Intermediaries can gain a “green” marketing advantage by announcing their products’ use of urban wood and Emerald Ash Board. 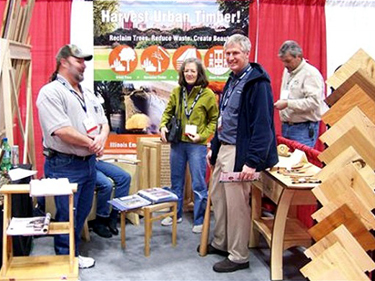 The Team is working to build awareness of urban wood as a sourcing option with industry buyers by exhibiting at the industry trade shows: International Green Build Conference and Dollars & Sense of Going Green. Since architects and designers respond to building standards and certification systems, the Team is working to develop certification systems for urban wood. The team submitted comments during the open comment period on standards for wood for the U.S. Green Building Council’s Leadership in Energy and Environmental Design (LEED) Green Building Rating System™ a major driver of the green market. And, as part of a multi-state consortium with Wisconsin and Michigan, the Team received a grant from the U.S. Forest Service Wood Education and Resource Center to address Marketing Urban Wood Through Certification and Branding.